I had the ever living **** scared out of me this morning on the way to work. Let me paint the scene. I hadn't driven the truck in about a week. During this time it was parked under a giant Pin Oak with the windows cracked about an inch. When I established "The Position," I got a head full of sticky silk web ... a little annoying to pull out of my hair, but I was sleep deprived and I barely noticed. I lugged the laptop into the seat, slammed the door, turned up the radio and threw it on autopilot. So I'm slogging my way to work, past the garbage truck (it must have been a Tuesday), past the 4-way stop, switching between Johnny Dare and whatever crap they were playing on 96.5, shifting gears and yellin at the slow guy in front of me. Everything was perfectly routine. I was completely oblivious to the situation "unraveling" just out of sight. As soon as I hit the 40 mph stretch, my eyes caught movement on the edge of the sun visor. The next part is kind of blurry. I think I blinked, and then I glanced up to see the most terrifying, pissed off, spiny-haired, striped-legged, tarantulous amazonian spider I've ever been within 10 feet of (without a can of brake cleaner and blow torch.) I didn't even have time to react before it lowered itself two inches from my nose. Let's recap. I'm normally pretty calm and collected, but I completely lost it. Both hands were off the steering wheel flailing around like "DDR kid." 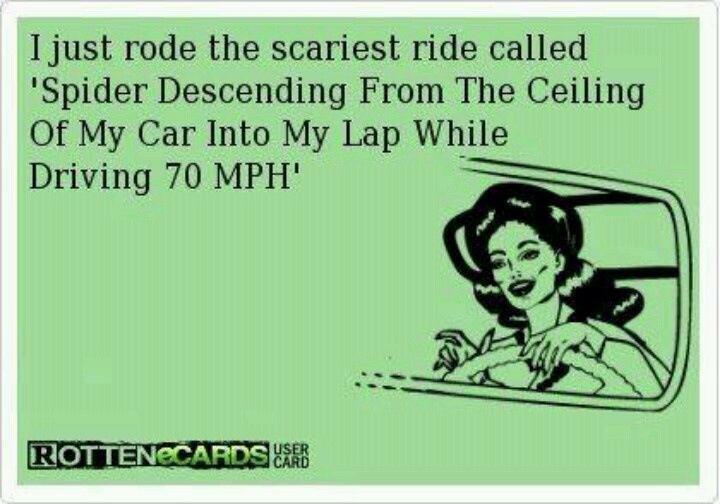 I was already standing up in my seat making some VERY evasive maneuvers. The scene flying by outside slowed to a Matrix-like crawl. I let out my war cry "WHAT THE ****" .. The spider was taking a full speed dive straight for my lap. I was about 2 picoseconds from launching myself out the door. Fortunately, fate was generous. The 8 legged passenger reversed direction and reacquainted itself with the sun visor. It probably knew I didn't want a damn thing to do with it. I frantically accepted my good fortune and scrambled for something to splatter it with. The first thing my hand touched was a CD. I don't even remember what band. It could have been a collectors edition Eddie Van Halen and I wouldn't have cared. I ducked low, took aim and slapped it straight against the headliner. Splat. Direct blow. Spider guts everywhere. Threat eliminated, now I had more immediate problems to deal with. I threw the ruined CD and regained control of the wheel, which over the last 5 seconds of horror had steered out of the lane. I checked my rear view mirror to see if there were any witnesses. From behind, it probably looked like I was having a major case of tourettes. The rest of the trip went a little nervously, but uneventful. Before I had a chance to clean up, the spider carcass fell into my lap startling me briefly one more time. But I'll put it this way. At least by the time I got to work, I was awake. Haha it was probably a harmless orb weaver. Little sucker. He got me good. I was on my way to work and stopped at quick trip to get gas for my street bike and while fueling I took my helmet off and set it next to the pump. After filling up I set out and just got on the highway when somethig crawled across my nose. Lets just say I mad it to the side of the road quicker than I thought possible. It must have been funny to all that were passing as I thew my helmet off into the grass and was jumping around trying to find where the spider wennt. I never did find the spider but after that I always checked my helmet before putting it on. Always look in my own helmet now also, I was at the Lake of the Ozarks and was warming my bike up and cleaning the dew off the windshield. Laid my helmet on the charcoal grill and got about 10 miles down the windy lake roads when a spider dropped down on my nose. I hit the ditch without laying it over and started punching myself in the face through my visor. I did get it and I was definitely awake for the rest of the ride home. Great stories guys, I don't know if I should laugh or jump up in my chair.